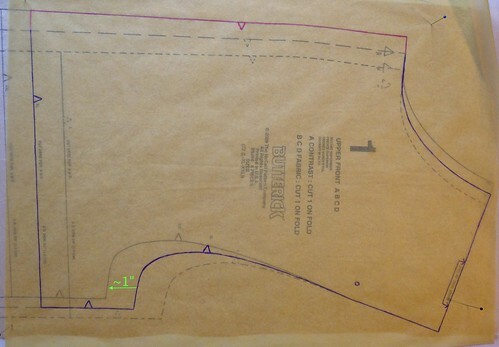 When I started Butterick 5356 for the second time, I was not in the mood to use woven fabric, even for the yoke. But I did, in the name of science… with a knit, I would not have been able to tell as easily if the changes I made were right. This one is indeed a much better fit, and it’s perfectly comfortable because of that. I’ll explain what I did. I’ve now washed and worn both of these new tops more than once, and this second one looks and feels much better at the arms/yoke. I really like this pattern now, and I will likely make it again. It doesn’t take much time at all and is a little nicer than a plain t-shirt. I think the main limitation is that it doesn’t easily lend itself to the more fitted silhouette that some prefer. As I mentioned last time, it’s definitely better with something drapey, at least for the lower part, despite the “lightweight broadcloth and stable knits” fabric recommendation on the envelope. Ye ol’ envelope… sometimes it knows stuff, sometimes not so much. Lastly, a fabric detail shot. 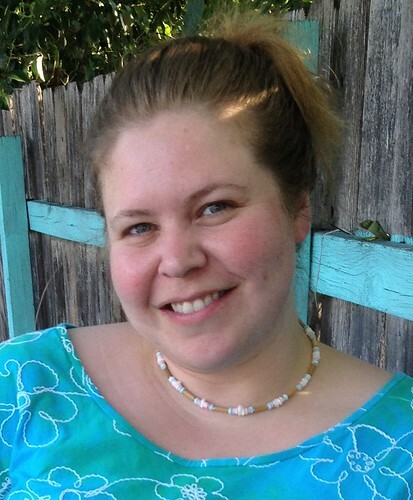 I made the yoke from a lightweight cotton shirting from Sarah’s Fabrics. The main fabric is a bamboo knit from Common Thread — it’s medium in terms of thickness, but somehow bamboo is quite heavy weight-wise, so that makes it drape well. It’s awfully soft, too. This is my first time using an all-bamboo knit, so I don’t know how likely it is to pill — anyone have experience with that? Your top is really cute. Thanks for including your fitting tips; that really helps. I have used bamboo knit and mine have not pilled. My only complaint is they take forever to dry in the dryer. I guess, I should not be putting my knits in the dryer anyway…oh well. I just found your blog through your review at PR. 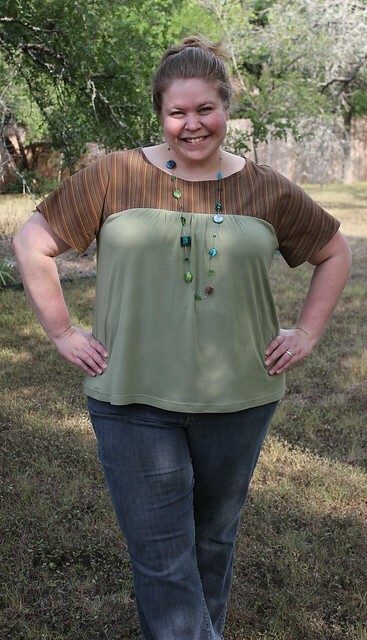 Great blog and lovely top – and even more excitingly (is that even a word?) for me…I think we are fairly similar in shape! So it (and the alterations you so kindly showed) should work for me, too. I’m now going to spend a little while going back through your other posts. Thanks! I’ve seen this pattern before, and it looks like such a great idea, but I think the execution can be challenging. Thanks for explaining your process on this one. It looks so nice on you! REALLY cute one, sis! Love it. An Austinite?! Yay! I cannot tell you how excited I get when I “meet” an Austin sewist online. I’ve been wondering how big the sewing community is there since I’ll be moving back there eventually. I love the top and mix of fabric types. Great improvement on the size. It looks great. Susan, you did well with the changes, it looks like a perfect fit now. Great job not giving up and pushing through the frustration! hey! nice top! great job on the fit. i like the color combo. you really are cranking out the garments! i’ve used all bamboo rayon before and it did pill, mostly under the arms where you’d expect from lots of fabric rubbing against fabric. I really enjoyed your photos and details of how you changed the pattern to give you the lovely fit you wanted! I’ve been thinking of buying this pattern, but was concerned about buying it for my larger bust size and smaller shoulders. Your tips are just what I needed! Thanks so much! Love your beautifully-fitted result! Thank you Cynthia! 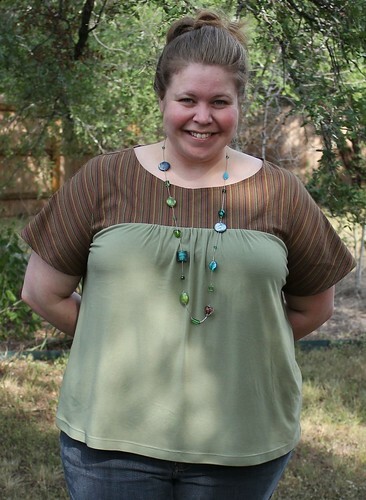 I have been meaning to revisit this pattern… I have worn out every top I made from it!